Late last week, Daimler AG officially showcased their latest innovation: the Mercedes-Benz Future Truck 2025. This innovation is the first autonomous semi-truck ever introduced to the market, and many believe that it could change the entire industry. According to Daimler, the “Future Truck” would work much like an airplane in that drivers would start the vehicle, guide it into interstate traffic, and then let the truck do the rest through a feature known as Highway Pilot. Once in traffic, the Highway Pilot application keeps the truck traveling at a steady 52 miles per hour. The truck is also fully equipped to navigate through single and double lane roads, pedestrians, and foreign moving objects. This capability is made possible through a series of sensors and cameras that range upwards of 250 yards in each direction. In a filmed test run (see below) done by Daimler, the Future Truck showcased all of these capabilities along an 8 lane stretch of the A14 autobahn in East Germany. 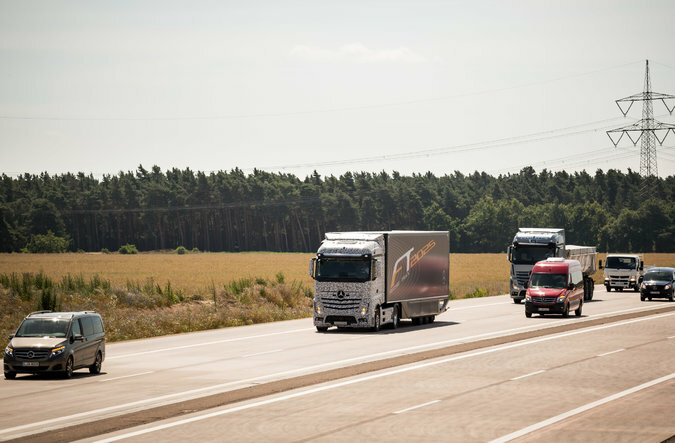 During the test, the truck drove side by side with 20 other vehicles, responding to increasing and decreasing speeds. The truck also smoothly slid to the far right lane when an emergency vehicle needed to pass. So far, Daimler has only made one model and is unsure of how much the truck will cost when it hits the market in 2025. They are, however, very confident that the vehicle will be a success, as long as they stay focused on setting the legal aspects in line to ensure that the release is seamless. This entry was posted in Culture and tagged autonomous, east germany, mercedes benz, semi truck, wolfgang bernhard. Bookmark the permalink.